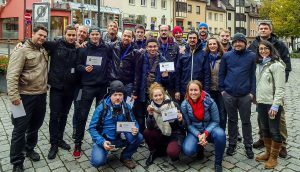 This past weekend was a very special one for Pokeshot – we took our entire staff out on a day-and-a-half trip to Nuremburg, all in the name of getting better acquainted and building team spirit. At noon sharp, we boarded the chartered bus at our office in Berlin-Adlershof and left on the approximately four-and-a-half-hour trip to Nuremberg. On board were Pokeshot CEO Stephan Müller-Ziebur, the company’s Berlin employees, and Stan and Sayoda, who traveled here specifically for this event all the way from San Diego and Dublin respectively. After a lighthearted journey that included snacks and cold drinks, we rolled into Nuremberg in the early evening and checked in to our accommodation. We then took public transit to Pokeshot’s Nuremberg office, where our Franconian colleagues warmly welcomed us and gave us a tour of the premises. It was then off to Restaurant Kopernikus, which is located in the Krakow Tower. Dining at this eatery is a must for every visitor to Nuremberg’s historic old city. Stuffed and content, we then proceeded to a local bar for a nightcap before returning to our lodging in Schwaig, where we fell exhausted into our beds. What an eventful day it had been. The next morning we got an early start. Breakfast was at 8 o’clock, and afterwards we headed downtown for the first item on Saturday’s program – a geocaching treasure hunt that kicked off at 10 o’clock in Nuremberg’s old city. We divided into three teams, with each team receiving a map, a GPS device and a notepad with puzzles to solve. The answers were of course spread all across the city so the players had to cover quite some distance. Everyone learned a lot about Nuremberg’s history and got plenty of fresh air while putting their brains to work to crack the challenging puzzles. In the end Team Boxbeutel edged out Team Schäuffle for the victory. 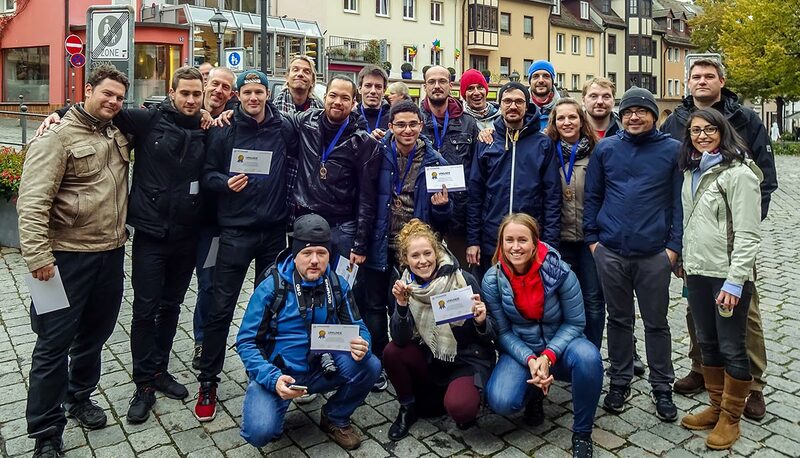 Congratulations to the winners and many thanks to the organizers – everyone had a real blast! 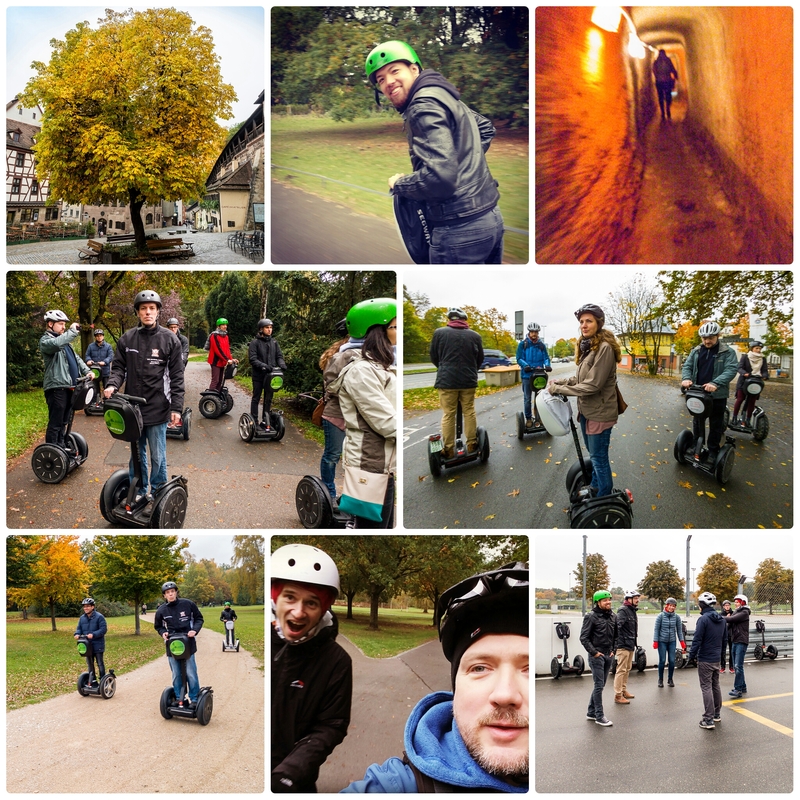 After a short break at a nearby café, it was time to begin the second item on our program – a Segway tour of the Reich Party Rally Grounds. 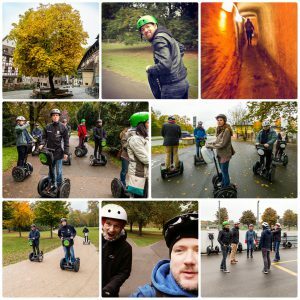 After learning how everything worked from experienced guides and familiarizing ourselves with the two-wheeled machines, we then took off over hill and dale – into the Luitpold Arena, past the Congress Hall and Silbersee (Silver Lake), across the Zeppelin Field all the way to the Great Road, and then back again. The tour was simply amazing! If such a machine didn’t cost 9,000 euros, every one of us would soon be the proud owner of a Segway. But the day was still far from over – we now took a tour through Nuremberg’s historic underground stone passageways. At the end of the 14th century Nuremberg was home to more than 40 breweries, which were required by law to have their own beer cellar for storage and fermentation. The one-hour tour gave us fascinating insights into the history of this subterranean labyrinth. 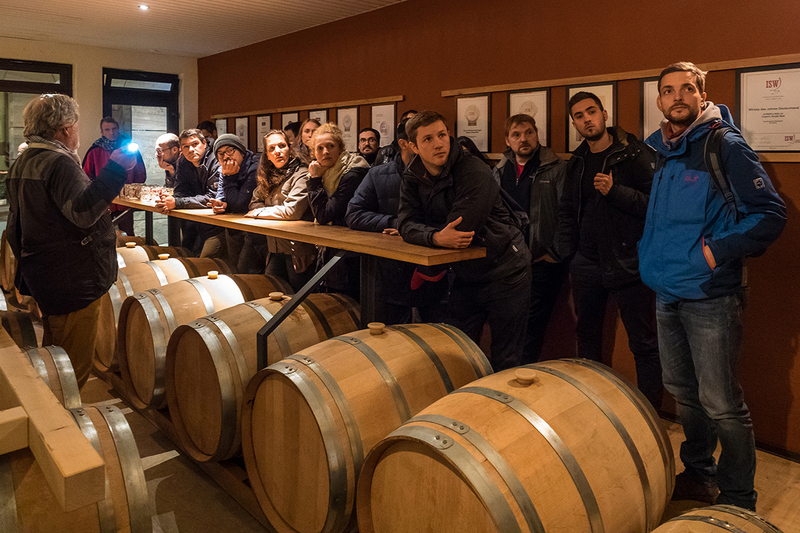 It was an absolutely captivating experience – and ended with a homebrewed beer! A visit to a disco, where everyone let loose on the dance floor, provided the crowning finale to what had been a truly amazing day. The next morning naturally came too quickly for everyone who danced late into the night. Luckily, a wonderful breakfast was prepared that lured everyone out of bed. The incredible weekend in Nuremberg not only offered the Pokeshot team a fun and memorable program, but also forged closer bonds between team members and showed how strong we are together.